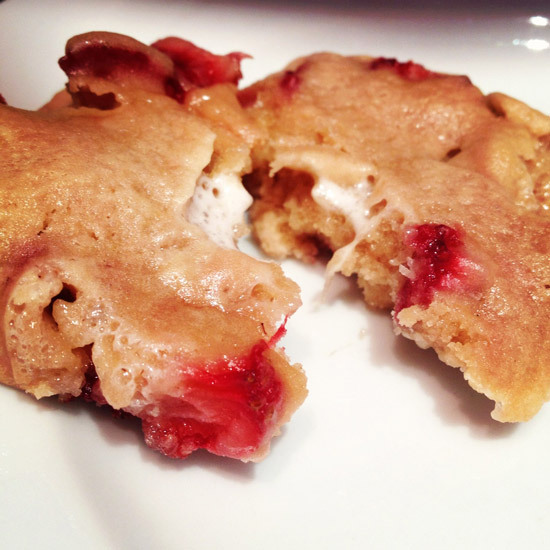 High off my success at baking sugar cookies, I decided to get more inventive and found a delicious sounding Strawberry Marshmallow recipe that was very intriguing. As I may have mentioned elsewhere, baking is not my speciality and the usual round of mishaps followed: I only had dark brown sugar instead of light, an extra trip to the store was required to get parchment paper, and when my egg broken open out plopped two yolks (which, I’d like to point out was entirely beyond my control). 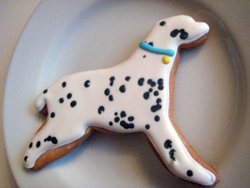 Still, an interesting batch of cookies were made. They are cake-ier than I imagined and the marshmallows are sort of lost in the process. Once I got past my expectations, though, these were quite tasty – almost like a strawberry shortcake in cookie form. PS: You, whoever you are, are presumably a better baker so yours will likely be even better. 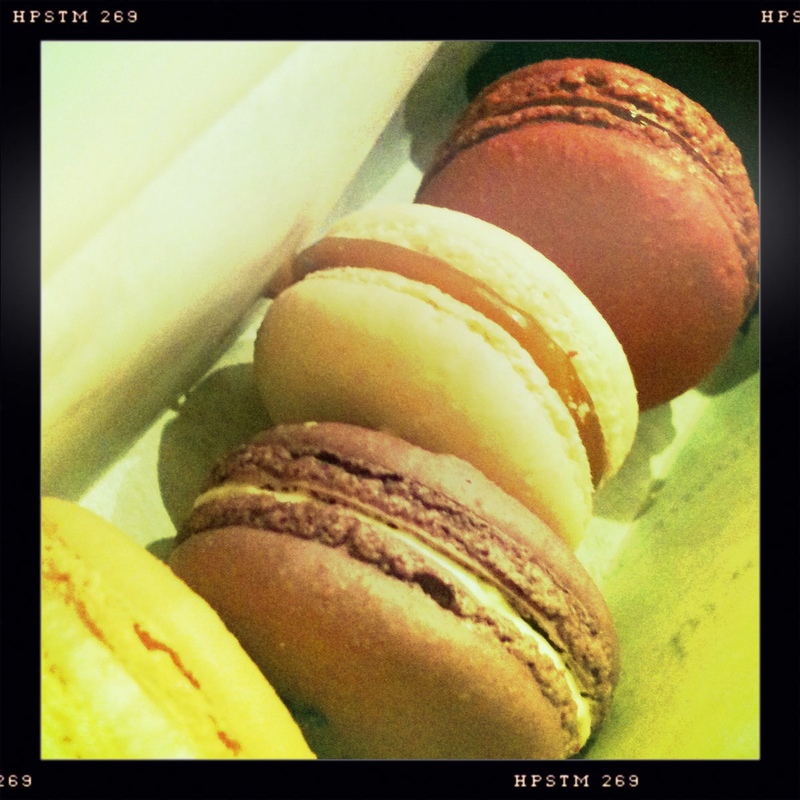 Creamy lattes and sweet macaroons the size of sand dollars; there’s much to love about the popular Thomas Keller Bouchon Bakery. The environment is all about civility and the baked goods taste fresh and delicious so you don’t even mind walking out thirteen dollars poorer. 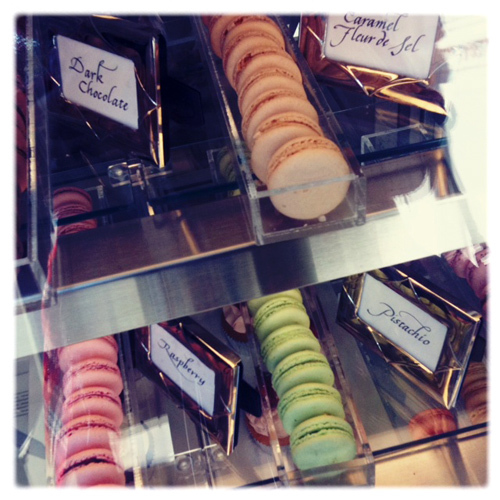 We tried the vanilla and passion fruit macaroons- both recommended. 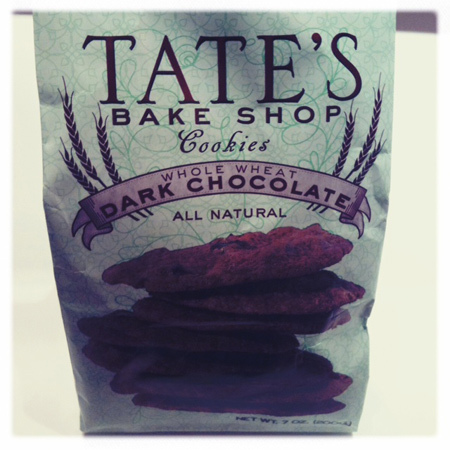 I would have never tried these Tate’s Bake Shop Cookies if Mike hadn’t brought them over for D&D one night. Reluctant would be the word to describe me around whole wheat, but I am just stubbornly unhealthy that way, flour-wise. But these things are good, my any measure. Jim, in fact, deemed them “too good” and tries to make himself feel better by only eating one half of a cookie at a time. 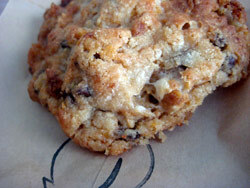 The aptly named West Village bakery Milk and Cookies offers a variety of the home made goodies to sample. Jim brought home half a dozen for a dinner night with friends. 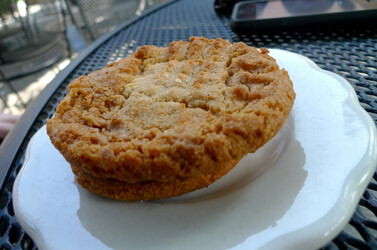 Of the bunch I was partial to the snickerdoodle – which was wonderfully thick and soft – just the way I like sugar cookies to be (but they are so often hard and thin!). Also of note was the salty oatmeal. 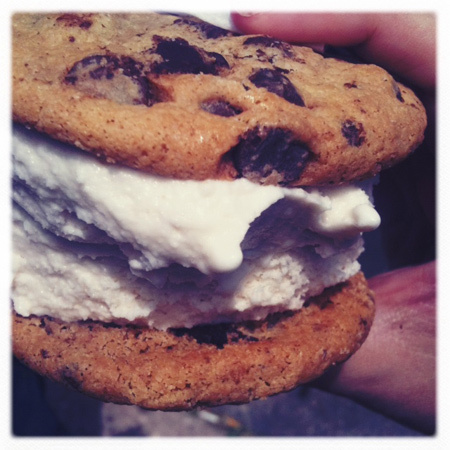 The chocolate chip and peanut butter were good too, but rank somewhere in the middle city wide (City Bakery and Momofuku are tough competition). Jim praises their helpful and friendly staff. I’d love to try their dry cookie mixes some day soon. I was invited to attend a Charity Cookie Exchange (more on that later) and wanted to make something resembling one of my favorites: the Cornflake Cookie from Momofuku Milk Bar. I found a make at home version on the blog Making House. While I can’t claim they were quite as divine as the rich, exquisite Momofuku ones, I was very pleased with the chewy mix of textures and tastes. 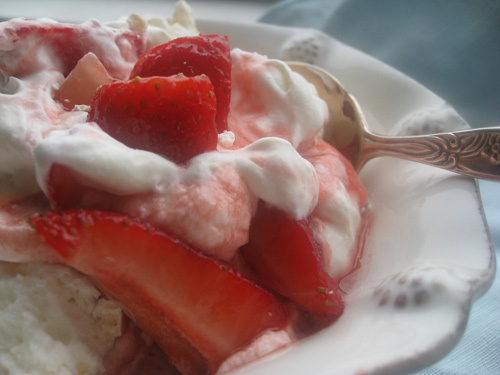 I would make these again and can now that I have all the ingredients. (Nice to have mini marshmallows in the house – gives one an excuse to make hot cocoa). 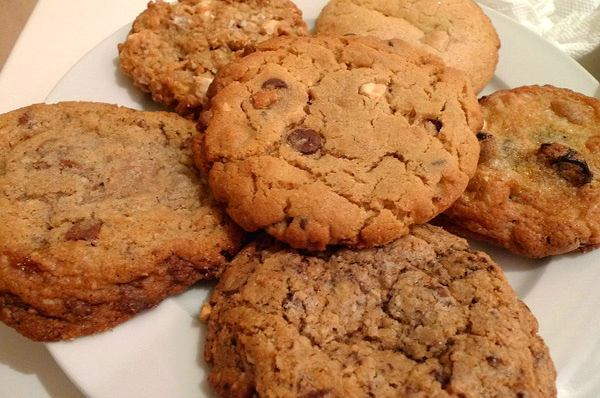 While these are pretty easy to make I have one word of advise: refrigerate the dough before baking – the recipe says it’s optional, but even with hard cold dough, these babies spread like crazy so also make sure to leave room between cookies. 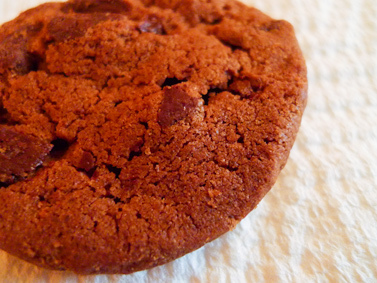 The taste duo of chewy and crisp is found perfectly, I believe, in cookies, and only in a few cookies made in some magical way I can’t replicate at that. 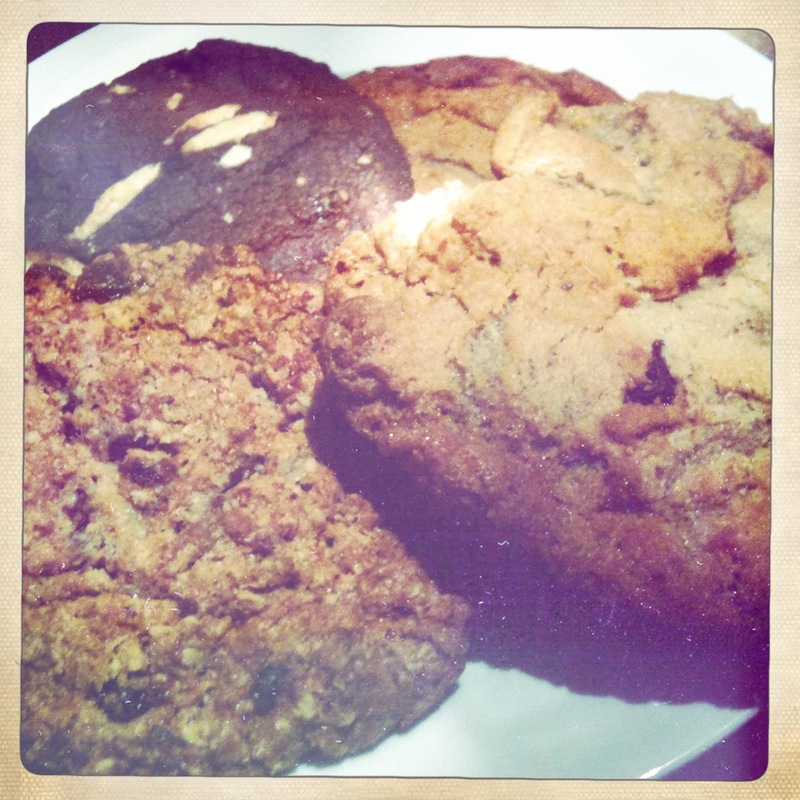 Birdbath, a neighborhood green bakery, from the people who run City Bakery delivers an array of awesome cookies. Jim picked up a variety from the west village location (there are several throughout the city) and I have to put my vote in for the classic chocolate chip as the favorite (though the dark chocolate with white chocolate chips was not far behind). 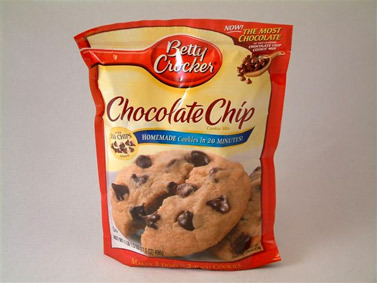 While the common agreement tends to be that anything homemade from scratch is better than a grocery bought mix, Betty Crocker’s Chocolate Chip Cookie Mix might persuade a few purists that the easy road to chocolate chip goodness isn’t always the worst way to go. It’s been instrumental in fulfilling cravings without much effort and the end result is seriously tasty. 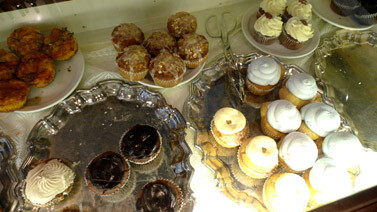 If you find yourself as I was, craving a cupcake in the middle of the day in Providence, there’s no need to worry. 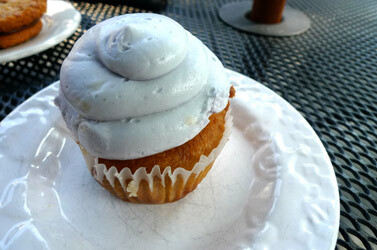 Not only will you find a cupcake at the adorable Duck and Bunny, but you’ll find a great buttermilk honey cupcake with Lavender Icing. Nutella sandwiched between two peanut butter cookies was Jim’s preferred indulgence and the modern wonderland in black and white decorated spot also boasted some pretty good coffee and a relaxing back garden. 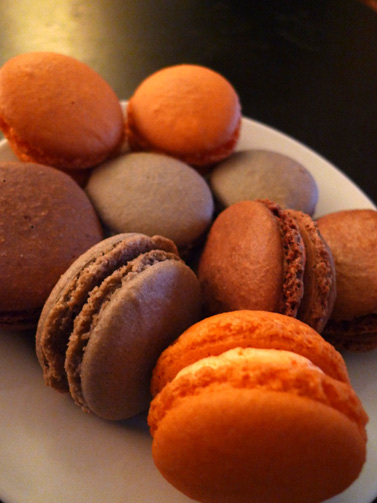 I enjoyed the pretty, sugary delights of French Macroons in Paris but am happy to learn that I don’t have to wait for another trip there to enjoy them again. 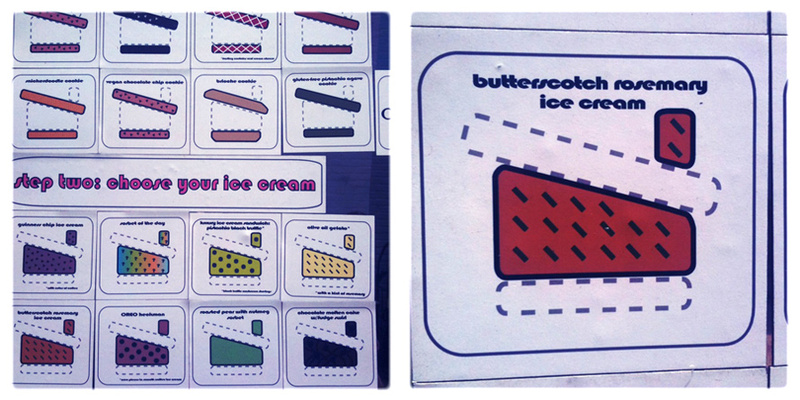 Greenpoint’s own Cookie Road now features a variety of enticing flavors like Blueberry, French Chocolate and Tangerine. I’ve praised the superlative baking skills of my coworker Sarafina before and I’m thrilled to share another wonderful recipe which she included in this year’s cookie gift bag: World Peace Cookies. The paring of sweet and salty is fantastic; the recipe comes from Dorie Greenspan, the baker bakers swear by. Bring a batch of these to your next holiday party and you’ll be a hit! While other establishments (the once exciting, now disappointing Ichiran and the unknown dark hole on Bedford at North 9th with the conspicuous stained glass window reading 'Girls All Night') are certainly taking eons longer than Cookie Road did to open up, its imminent opening still seemed to have the neighborhood abuzz and impatient. Located on the corner of the ever expanding, almost-there shopping destination that is Franklin, the little shop has brightened the neighborhood in a weird but fun way with a mural depicting Charlie Chaplin and a couple of penguins. Inside, the shop is more subdued with a counter full of both signature decorated sugar cookies and various tartlets and pastries. On our first visit we chose a sightless Dalmatian (though we would have opted for the Michael Jackson portrait ones that were available the next week for obvious reasons). As no particular fan of the simple sugar cookie, it's hard for me to judge the taste… it tasted like a sugar cookie with the standard hard icing on top. But I can tell you for certain though that the key lime tart and the rocky road cookie we brought as dessert offerings to a friends' dinner were excellent. The tart gets high marks for the buttery graham cookie crust that tastes like something your non-health conscious grandmother would feed you with love. And the owners, both Polish and keeping it local, are sweet as can be. 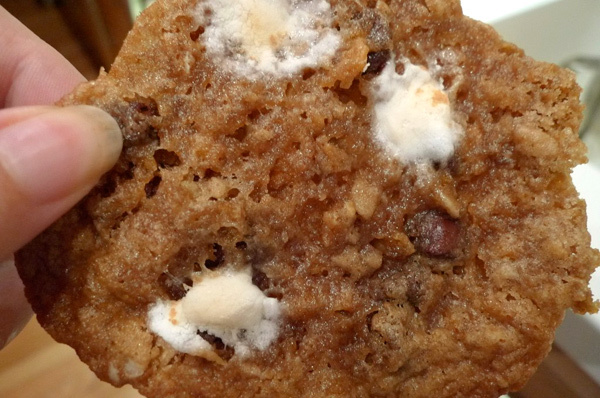 Ever wondered what a belly-filling, all cookie meal might be like? 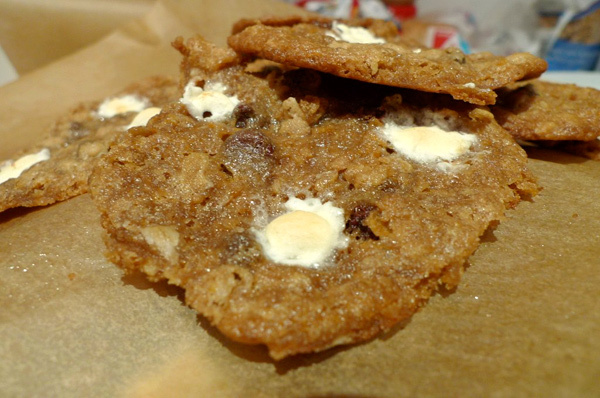 Head over to the ever inventive (the menu includes cereal milk and fireball soft serve) Momofuku Milk and order one of their incredible cookie creations. I opted for Cornflake, Marshmallow, and Chocolate and I think I can safely say it's one of the greatest cookies on earth.